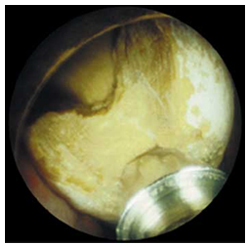 Disintegration & extraction of kidney stones with a telescope placed into the kidney (see below) through a small puncture in the back. This usually includes cystoscopy and x-ray screening. Kidney stones treated with PCNL are usually larger than 1.5 cm or cannot be effectively treated with ESWL or ureteroscopy. On occasion, smaller stones may be treated by PCNL if there is a history of serious infection or if the kidney is malformed. If you are taking Aspirin or Clopidogrel on a regular basis, you must discuss this with your urologist because these drugs can cause increased bleeding after surgery. There may be a balance of risk where stopping them will reduce the chances of bleeding but this can result in increased clotting, which may also carry a risk to your health. This will, therefore, need careful discussion with regard to risks and benefits. You will usually be admitted on the same day as your surgery. You will normally receive an appointment for pre-assessment, approximately 14 days before your admission, to assess your general fitness, to screen for the carriage of MRSA and to perform some baseline investigations. After admission, you will be seen by members of the medical team which may include the Consultant, Specialist Registrar, House Officer and your named nurse. An X-ray may be taken in advance of surgery to confirm the position of your stone(s). You will be asked not to eat or drink for 6 hours before surgery and, immediately before the operation, you may be given a pre-medication by the anaesthetist which will make you dry-mouthed and pleasantly sleepy. If you are admitted on the day before surgery, you will normally be given antibiotics into a vein to prevent any infection at the time surgery. Normally, a full general anaesthetic will be used and you will be asleep throughout the procedure. You will usually be given injectable antibiotics before the procedure, after checking for any allergies. The operation is usually carried out in a single stage. First, a small tube is inserted up the ureter into the kidney by means of a telescope passed into the bladder. You are then turned on to your face and a puncture track into the kidney is established, using X-ray guidance. 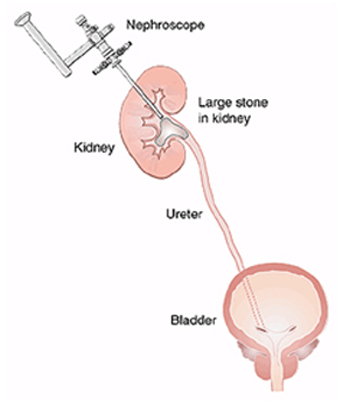 Finally, a telescope is passed into the kidney and the stone(s) extracted or disintegrated with ultrasound (see below). A catheter is usually left in the bladder at the end of the procedure together with a drainage tube in the kidney. Problems relating to the anaesthetic: such as a chest infection; deep vein thrombosis or DVT (blood clot in the legs); a pulmonary embolus (blood clot in the lung); stroke; or heart attack. Bleeding: in or around the kidney. Some bleeding is normal; only rarely (1%) is it heavy, needing further treatment. You will notice this bleeding as you will pass blood in your urine. Retained fragments: sometimes not all the stones are removed and these may need further treatment. Rarely, a temporary internal drainage tube called a stent is inserted during the procedure and left in place. This small tube runs from the kidney down to the bladder to make sure that the kidney is able to drain urine while any small fragments of stone are passed. If it is has a string attached, it is removed within 24 – 48 hrs, if it does not have a string attached it can be removed within six weeks. An x-ray is taken before removing the stent to find out if the fragments have passed with the urine. Infection: because some stones have bacteria trapped within them, we give you antibiotics routinely to prevent infection after the operation. A raised temperature is common after this procedure, but this is usually temporary. There is a 0.5% risk of sepsis. Injury to the lung cavity: there is a small chance of air or fluids pockets forming around a lung if the access channel is made toward the upper portion of the kidney. These pockets are treated with a chest tube, which allows the fluid to drain from around the lung. Bowel perforation: there is a possibility of damaging the bowel during the operation, although this is rare.